Unlike the Europeans who came, saw and conquered North America, the Native Americans were never as hairy as their conquerors. 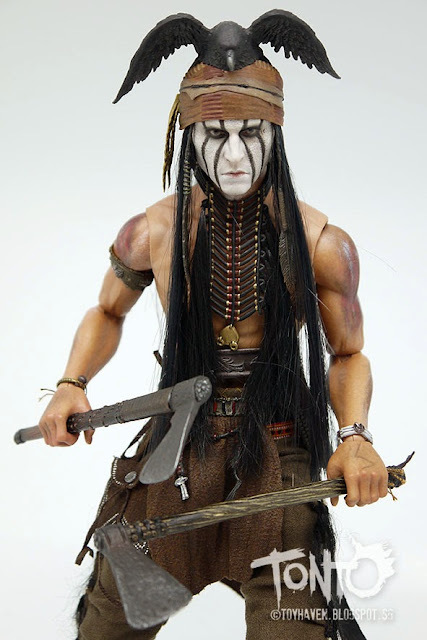 Yet, 1/6 scale Tonto does come with quite a bit of hair, real fabric hair that is implanted no less. I see no other way any other company could have done it with this collectible figure. The Red Indians (as they were called) didn't have much body hair but they certainly were proud of their crowning glory and they kept their hair long. 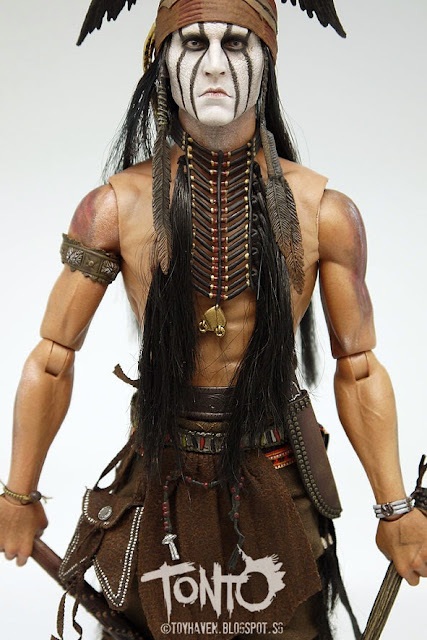 Not only does Hot Toys 12-inch Tonto figure have implanted hair on his head, his black and bronze-colored tribal necklace also has hair tied to it (see the two pictures below for comparison). And then there's the dead crow on his head. What's up with that? What would possess anyone to put a carcass there? Wouldn't it rot and smell after a while? I don't even know if this was ever a Native American headgear since Depp based the costume on a painting he came across. The decorations on the head and pants are non-detachable. Hot Toys advises strongly against taking them off. "Don't even TRY!" they say. The necklace on the other hand can be removed / detached. 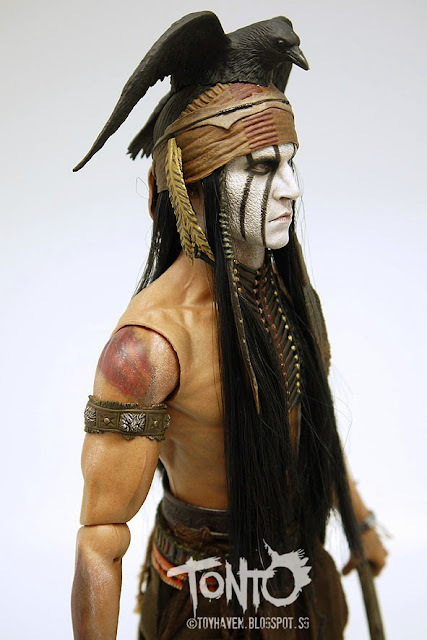 Once again, Hot Toys has done a stunning job on the 1/6 scale Johnny Depp as Tonto head sculpt. 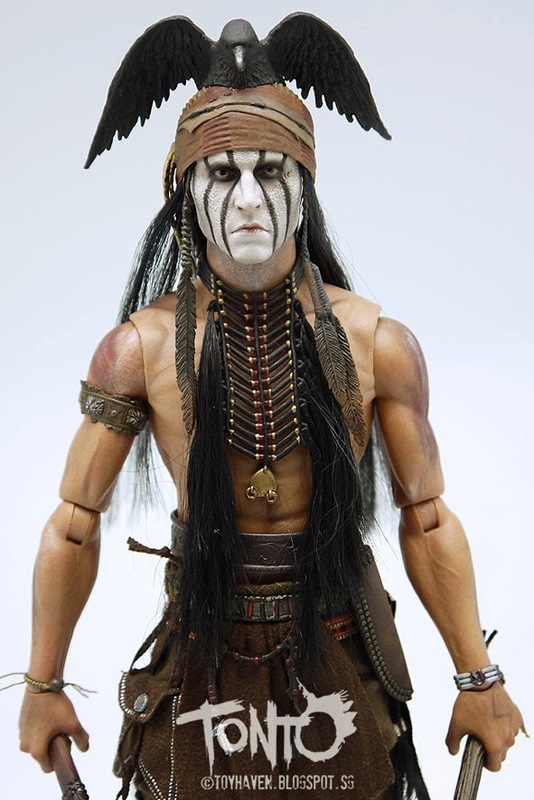 The sculpting and paint job is phenomenal and bears a strong resemblance to Johnny Depp with the likeness still showing over the white paint on his face. This is where Hot Toys really scores. 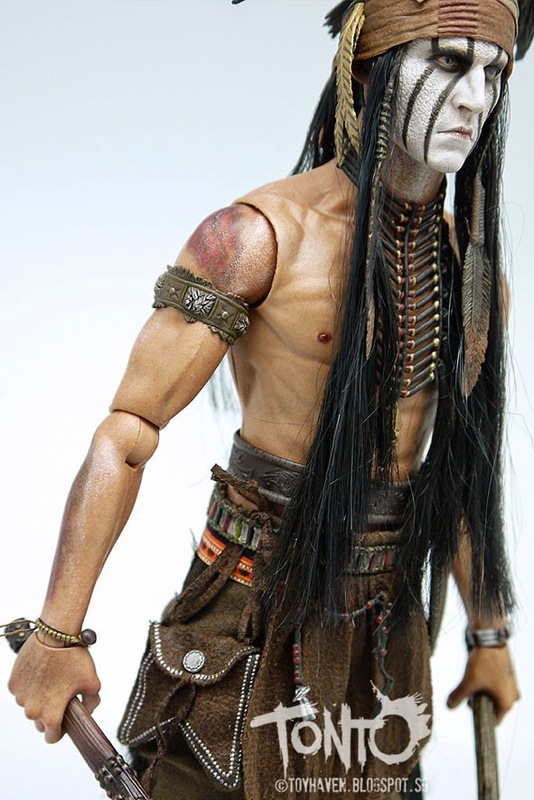 Tonto also wears a brown and white tribal armband on his right arm. This is removable and as a separate accessory. 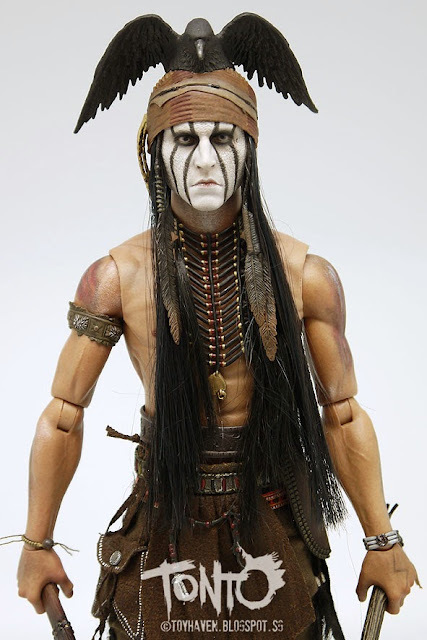 Hot Toys MMS217 The Lone Ranger: 1/6 scale Johnny Depp as Tonto Collectible Figure also comes with a pouch which can be opened to put the pocket watch inside. Two pocket watches are included. You can see them in my previous post. 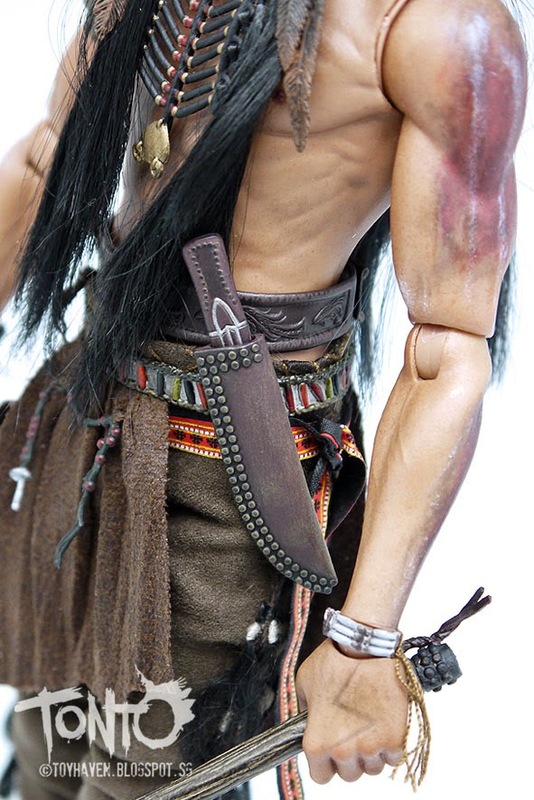 Tonto wears a bronze-colored bracelet around his right wrist. 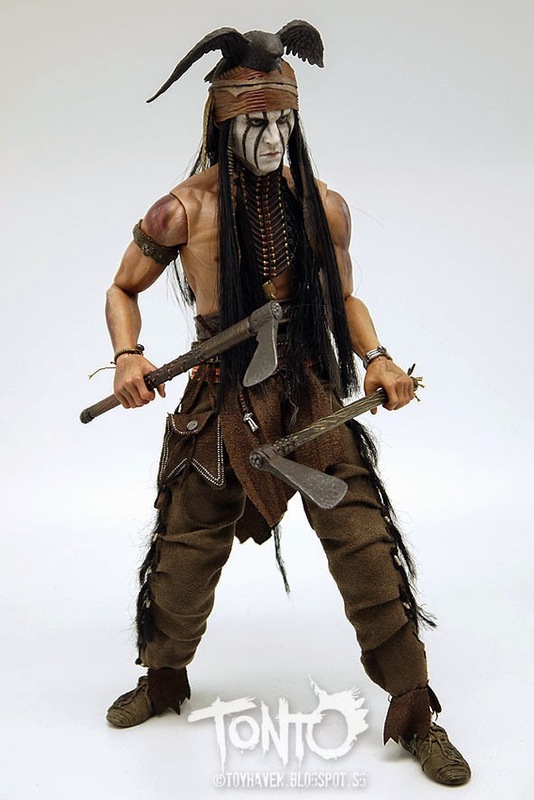 Hot Toys Tonto comes with two tomahawks (axes). A tomahawk (also referred to as a hawk) is a type of axe from North America, traditionally resembling a hatchet with a straight shaft. 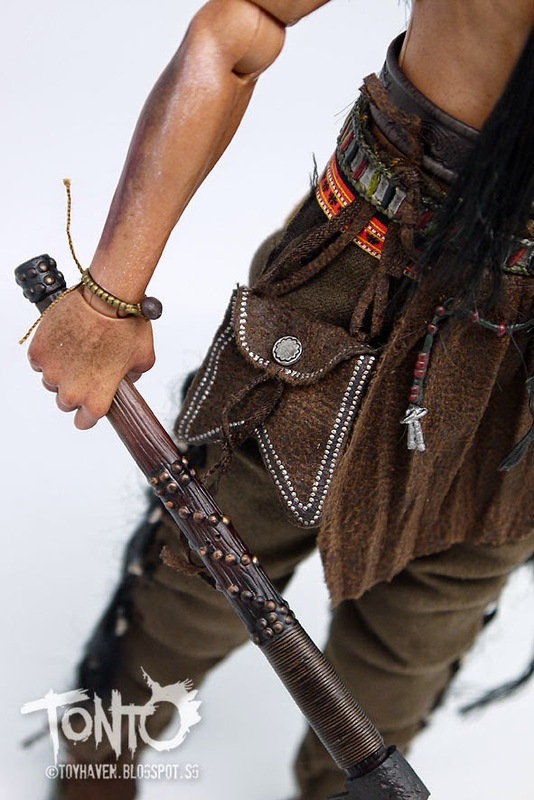 Tomahawks were general purpose tools used by Native Americans and European colonials alike, and often employed as a hand-to-hand or a thrown weapon. 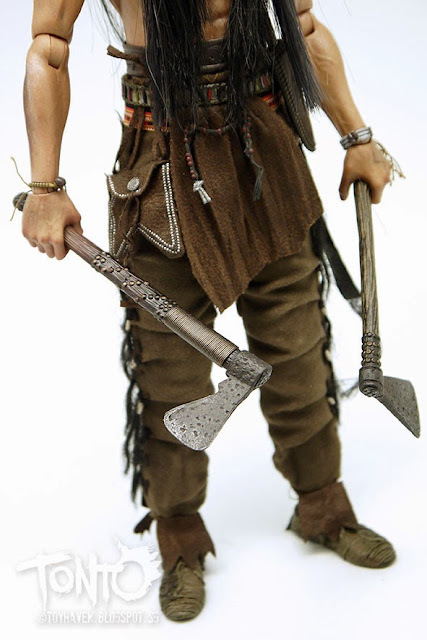 The metal tomahawk heads were originally based on a Royal Navy boarding axe and used as a trade-item with Native Americans for food and other provisions. 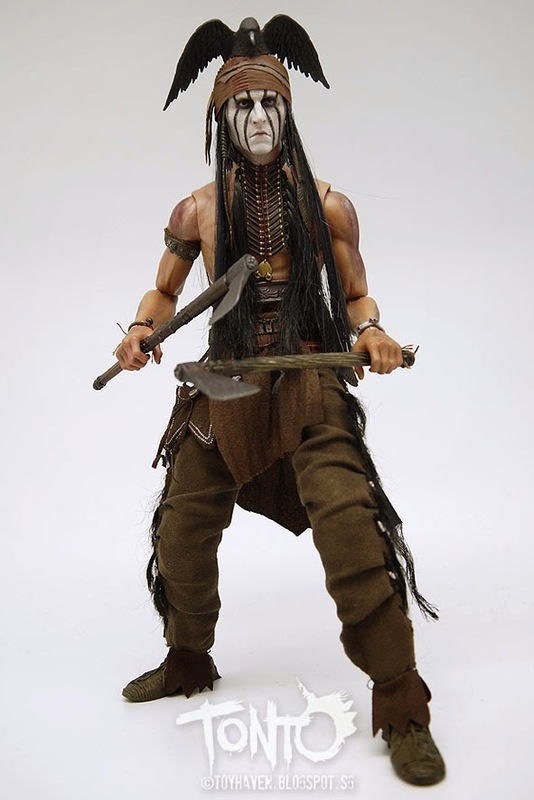 Another 1/6 scale figure that came with a tomahawk was the Sideshow Collectibles G.I. Joe Green Beret Lieutenant Falcon 12-inch Action Figure, reviewed recently HERE. 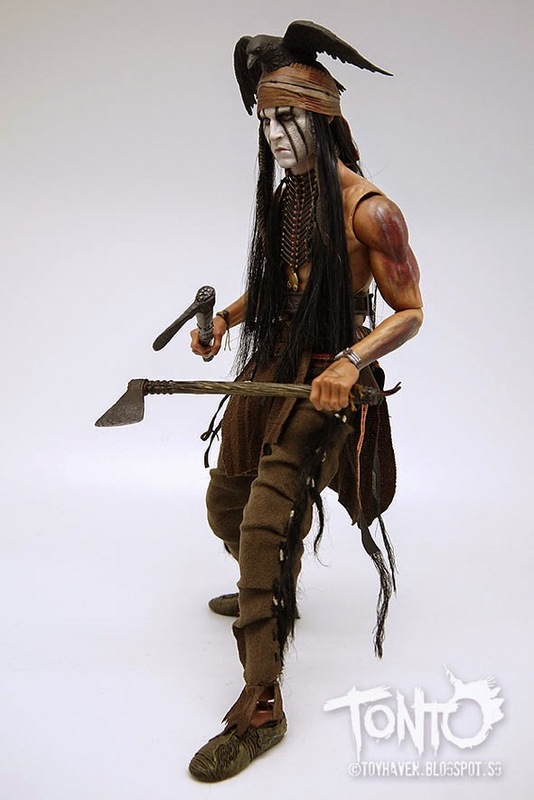 Check out the 1/6 scale moccasins. Another 12-inch Native American figure I have that also wears moccasins is Morning Star, a Northern Cheyenne Warrior - pictures posted HERE, alongside Goyathlay (better known as Geronimo). 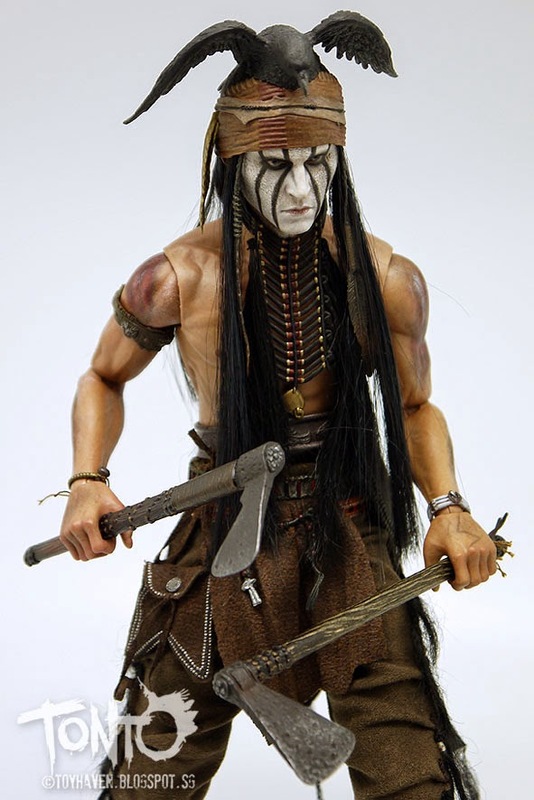 Another look at the "tattoos" found on Hot Toys 1/6 scale Tonto's body plus the dagger with sheath and white and bronze-colored bracelet worn on the left wrist. 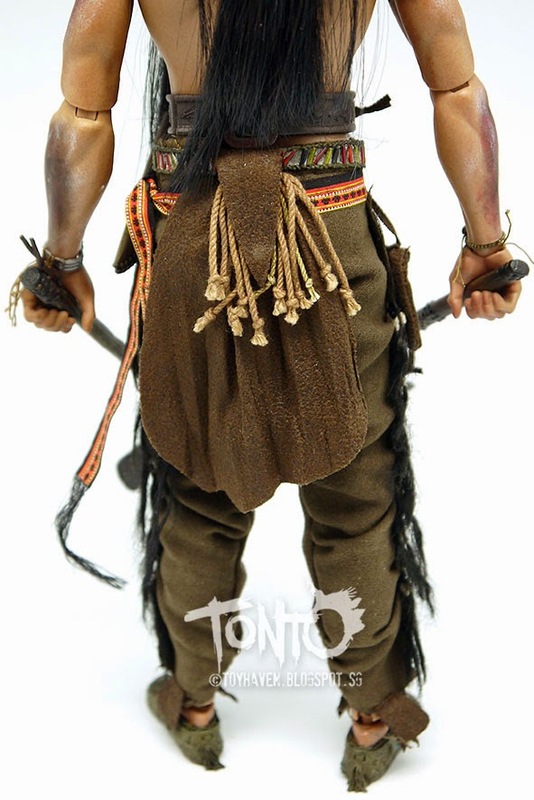 12-inch Tonto wears three different belts: One (1) leather-like black belt, One (1) multi-colored belt, and One (1) orange-colored belt. I don't think they are all meant to hold up his pants although they do add some color to his otherwise drab costume / outfit. 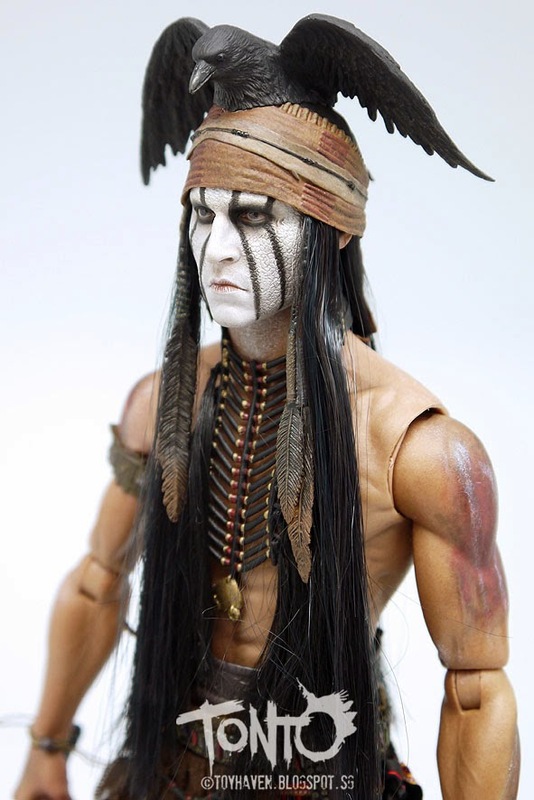 September 10, 2007 – The Lone Ranger and Tonto action figures by Exclusive Toy Products, Inc. produced in 1998 (pictures HERE). As for dead birds - yes, Natives used to wear dead birds as a part of their headgear and jewellery. 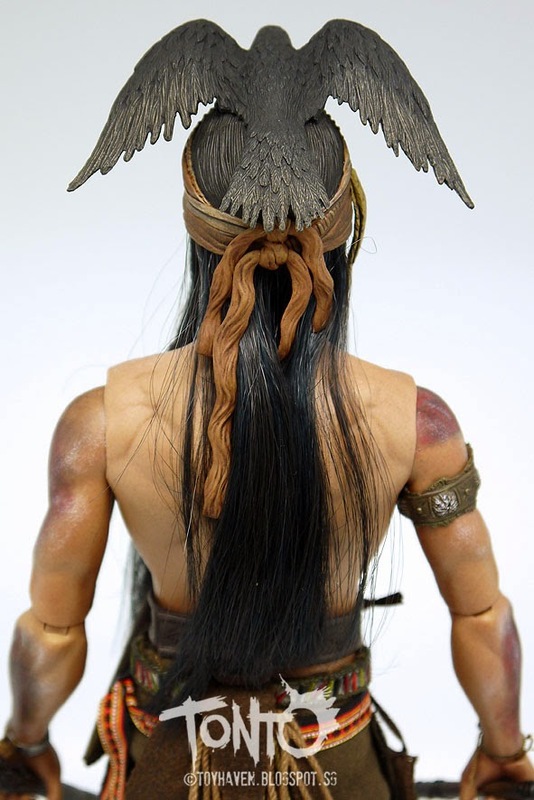 Crazy Horse (Oglala Lakota) used to wear whole hawk attached to his hair, when it was starting to smell he was replacing it with the new one. Plenty Coups, war chief of Apsalookee (Crow) wore dead chickadees as a earrings, and one additional in his medicine bundle.